ICCA’s annual statistics for the year 2014 on the number of rotating international association meetings hosted by countries and cities were released recently indicate overall stability in the MICE business. Paris, France retained its top city ranking alongside USA winning the top country ranking in the latest International Congress and Convention Association (ICCA) annual ratings. In the city rankings, Vienna swapped places with Madrid, moving up from three to two, and Berlin and Barcelona swapped places from four and five respectively. India holds the 35th position in the rankings worldwide and achieved 9th position in the Asia Pacific region, seeing 116 global business events in 2014. The major cities which hosted the events were Delhi, Hyderabad, Mumbai, Bangalore, Chennai, Kolkata, Goa, Chandigarh, Jaipur and Kerala. Hyderabad has emerged as one of the leading metros in India for MICE destinations, ranking only behind Delhi, and is on the fast track to becoming India’s Convention Capital. The city hosted 18 prestigious meetings in the year 2014. The significant contribution of Hyderabad International Convention Center is highlighted by the fact that 13 of these 18 meetings were hosted here. The city’s conference highlights from 2014 include the state of the art conferences like 3 ISHD Hemodialysis University (ISHD HDU), 9 International Symposium on Pneumococci and Pneumococcal Diseases , RCOG World Congress 2014, 36 International Conference on Software Engineering (ICSE), 22 IEEE International Conference on Program Comprehension (ICPC 2014), 12 Global Conference of the International Federation on Ageing (IFA), International Network for the Prevention of Elder Abuse 9 World Conference (INPEA2014) and 2014 World Elder Abuse Awareness Day (WEAAD), Conference of the International Association for Media and Communication Research (IAMCR), 7 International Conference on Geoscience Education, 22 International Cochrane Colloquium, 11 International Congress of the World Association of the Major Metropolises, Regional Convention 2014 of the World Federation of Rose Societies, 9 International Symposium on Software Engineering for Adaptive and Self-Managing Systems (SEAMS), 12 International Interdisciplinary Congress on Women (IICW 2014), 33 Session of the Asia-Pacific Fishery Commission (APFIC), 9 International Workshop on Methane Hydrate Research and Development, 6 Asian Communications of Glycobiology and Glycotechnology (ACGG), 6 Conference of the Brisbane Institute of Strengths Based Practice. The major catalyst for this growth is Hyderabad’s unique location and interesting benefits for both MICE and leisure travellers who can enjoy the world class infrastructure and experience warm hospitality & culture. Hyderabad International Convention Centre (HICC) is known to be one of the World’s biggest and finest Convention Centers and has played an important role in developing the city’s dream by contributing to position Hyderabad as the best MICE destination in South East Asia. In every aspect, be it infrastructure, service or technology, it compares with the best in the world. With a capacity to accommodate 50-9000 people, and equipped with 37 breakout rooms, in-house audio-visual technology, high ceilings and trained event management, HICC is the most sought after MICE destination in the country. 2015 is poised to be a strong year for Hyderabad International Convention Centre (HICC), with more events than ever before, including the 19th Indian Plumbing Conference, 29th IEEE International Parallel & Distributed Processing Symposium, FIMPART 2015, National Conference on Periodontics, Building Simulation 2015, 50th Indian Orthodontics Conference, 2015, International Union of Crystallography & many more. Hyderabad International Convention Centre has secured many more new conference bid wins for the city in 2014-15 that are expected to bring more than 9,000 delegates in the coming years, generating an escalation in the local economy. 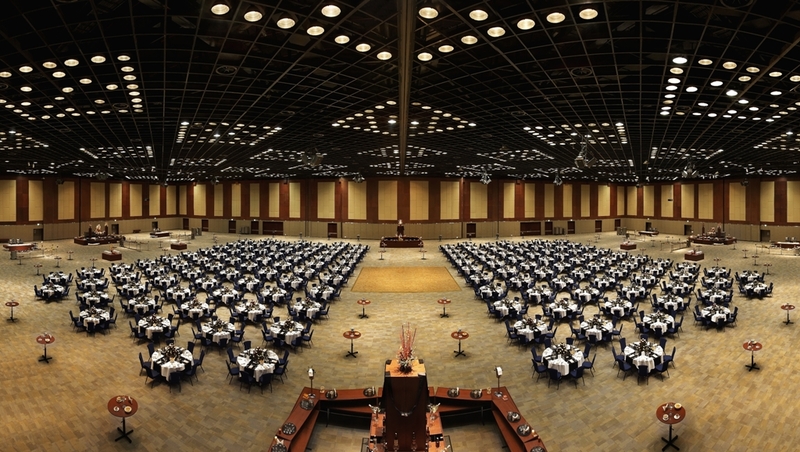 Securing a significant number of bid wins for the city in 2014-15, Hyderabad International Convention Center is all set to ring in its 10 year anniversary in 2016 by cementing its status as the most sought-after convention venue in the Asia Pacific region offering world-class facilities, state of the art infrastructure, and unparalleled hospitality while being strategically located in the tech-hub of Hyderabad, a city that offers an inventory of over 10000 rooms across various star category establishments in the vicinity. Another organization, Hyderabad Convention Visitors Bureau (HCVB) is India’s first and only regional Convention Visitors Bureau that plays a major role in promoting Hyderabad as a major MICE destination, positioning and offering world class infrastructure to handle versatile events. HCVB is a non- profit organization, initiated by the State Tourism Department which is also a stakeholder. HCVB being a membership organization, it is a One Stop Shop for MICE business enquiries and extends assistance to Convention Organizers in planning and facilitating conferences in Hyderabad. HCVB creates a single platform where the business relationships created between the Convention/Exhibition Buyers and Meeting Planners, work together for a mutual benefit. Hyderabad Convention Visitors Bureau stands by its motto of Taking Hyderabad to the World and Bringing the World to Hyderabad. The Bureau has been into existence since 4 years and has emerged a victor for 15 International & National Congresses and still counting. HCVB, a not-for-profit organization, allows MICE players to explore the endless possibilities of considering Hyderabad as the convention destination. Be it a small conference of an intimate group, a mid-size meeting of industry professionals, or a mega conference of 5000 delegates from around the world, HCVB assists in hosting a successful event. HCVB promotes and markets the City of Hyderabad, aiming to make it a chosen destination for conferences and conventions at national and global level, and is India’s only regional CVB and has been instrumental in harbouring most of the congress victories coming to Hyderabad. Strengthen the MICE tourism of Telangana by attracting major domestic and international conventions to the State. Position Hyderabad as a ‘thinking’ capital by drawing the world’s greatest thinkers and facilitating the exchange of knowledge and ideas. Support the local tourism industry by exposing delegates to the best of regional services, investment opportunities and tourist attractions. Deploy the cutting edge technology to deliver the value and demonstrate the competitive advantage. LatestOne.com Launches “PTron POWER-PLAY” Power Banks of 12,000 mAh & 16,800 mAh!